We have big news to share today and once again thank all those who have been part of making our nationwide support network such a huge success over the years. At the 2016 National Convention in Branson, we introduced a number of key changes that raised the standards for ourselves and the industry at large. Everyone involved in fine-tuning the new structure was amazed at how much better things became and were equally impressed by how well accepted it was for a smooth transition. We have such an amazing group of contractors who really care about each other and where we’re headed as a nationwide team. Today, we take another step further to better focus on what has been most beneficial to the network, while also adding new benefits by introducing a totally new brand: Top Roof Contractors. On the first of April, we’ll finally be ready to launch everything after having many conversations with both new and original members to ensure maximum benefit across the board. Special thanks to Sam, Jonathan, Will, Andy, Adib, and John! The first change to notice is that the terms “Endorsed” and “Supported” are going to be retired. Instead, we have “Leader” and “Member.” It’s a simple change where Endorsed Members will be called Leaders, and Supported Contractors will be called Members; but it’s important because of what these new terms mean. As part of the changes, contractors in the group will need to sign new agreements. The old agreements will terminate in 30 days in order to fully implement all changes and improvements group-wide. Of course, there are many more than we can list, but these are the main benefits. The membership fees for Leaders (previously known as Endorsed Members) has been reduced by more than half! This is made possible by transferring the building owner requests for estimates to Top Roof Contractors. Commercial roofing estimate requests have caused misunderstandings for contractors who are not yet part of the group. We have never been a lead generation service, but understand why our website can give this impression. 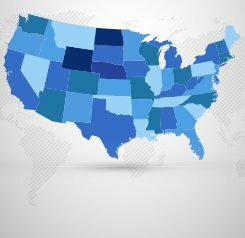 When a building owner requests an estimate in the future, it will now be routed through Top Roof Contractors. The only requirement to be an eligible Leader in Choice Roof Contractor Group is to create a Conklin account with an existing group member. 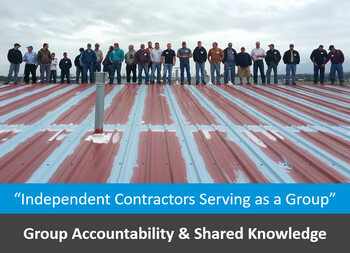 Even if you have limited roofing experience (or none at all), the contractors you bring in will have full support from others who can step in with their knowledge. Andrew and Max are working on an app for Choice Roof Contractors, Jonathan and Chris are working on a marketplace for Top Roof Contractors, and many new things will be coming down the line as well. 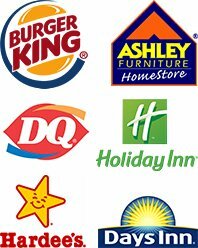 In summary, Choice Roof Contractor Group will mainly focus on building everyone’s Conklin business, while Top Roof Contractors will take on other aspects to reduce confusion of our group’s core focus and introduce new benefits that are now possible by having a 2nd independent brand. No fee for those who simply want great support (they only need to create a Conklin account with an existing group member to benefit from the amazing platform built over the last 5+ years: https://www.choiceroofcontractors.com/the-first-five-years/). 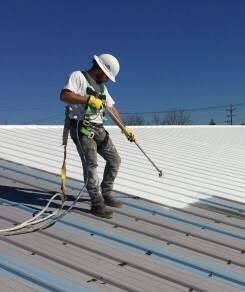 We’re still requiring 3 commercial roofing references and insurance verification to be eligible for leads (but there is an added screening process to add further respect for all Top Roof Contractors). Choice Roof Contractor Group Members (previously known as supported contractors) will still get assistance from the entire group, private access to the Facebook group, presentations and photos, in-depth knowledge and training, affiliation with our nationwide reputation, approval to use a member version of our logo, and sales & marketing guidance. Choice Roof Contractor Group Leaders (previously known as Endorsed Members) will still get personalized flyer, personalized business cards for sponsoring, contractor leads, and personal page on the ChoiceRoofContractors.com website; plus all the benefits listed above that Members enjoy. We have contemplated retiring the Lifetime Service Guarantee for quite sometime because it has hardly been used by endorsed members, plus many building owners seem to have a hard time understanding how it’s different from a warranty and none of us ever want a building owner to feel misled when working with our group. Even though it is a value-added benefit, it’s ultimately been decided to retire the guarantee. If you were issued a lifetime service guarantee certificate, please email lifetime@choiceroofgroup.com with a scanned copy and the program will be honored in original form. We look forward to integrating all the new benefits on April 1st, and are very excited to see all the great things to come! This entry was posted on Saturday, March 23rd, 2019 at 11:56 am and is filed under Building Owners, Commercial Roofing, Roof Contractor News. You can follow any responses to this entry through the Comments Feed feed. You can skip to the end and leave a response. Pinging is currently not allowed.